how can there be that many unknowns? did it just fall from the sky and land on your lawn? I like your pins-bits of garden hose shoved in? Sounds like you will have to register yourself as the builder. If it was deregistered and you got it as a new project you will have to go thru the whole process. Finish building it and you can go thru all the steps to become the official 'builder'. FISDO and DAR can tell you more of what you need to know to make the FAA happy. I was concerned about the comment in the first post about the epoxy being "Dried out" I'm assuming this to mean that there was probably a lot of cracking in the paint and micro layers. There were not many posts about that statement. 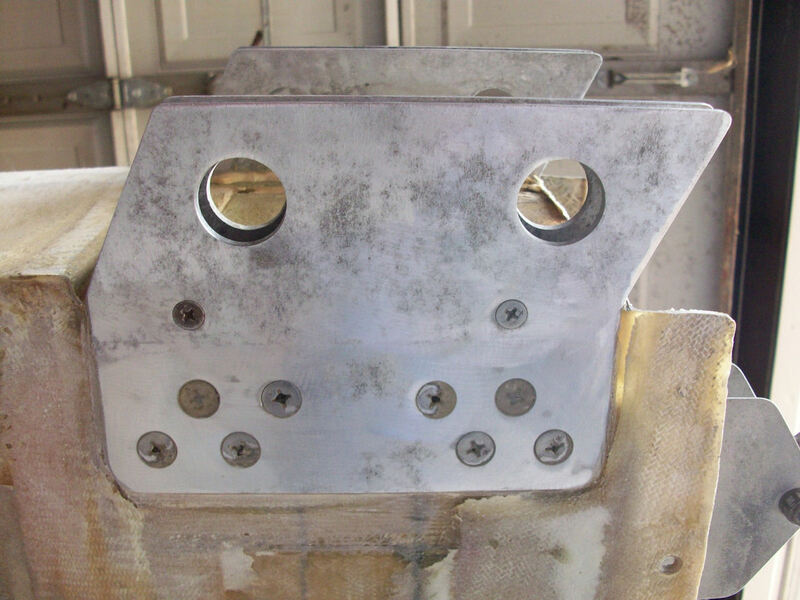 If the epoxy and glass layers are cracking or delaminating, the structure will have to be completely replaced. One trick is to wet it down with water and you will actually be able to look into some of the layers of glass/epoxy. This won't work with spars and internal structures of course. Good luck tracking any history and yess....... keep building! 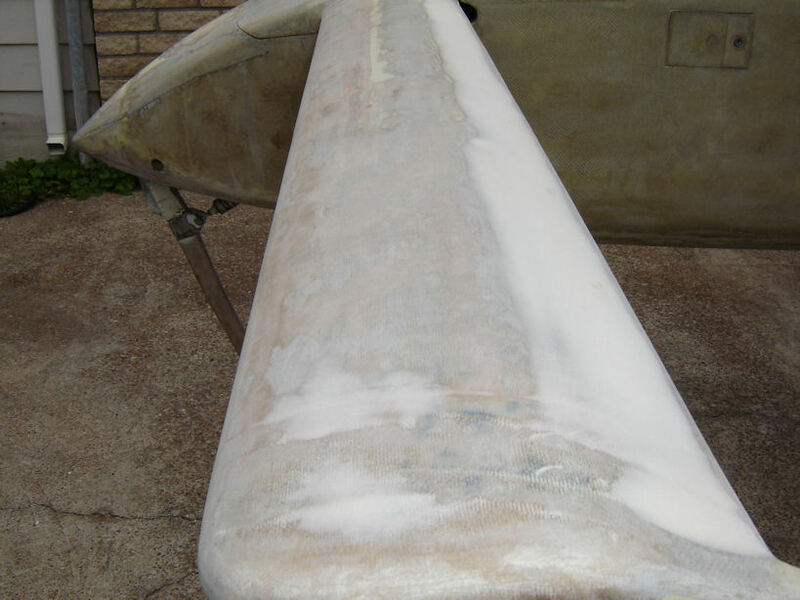 Fiberglass doesn't "dry" out. 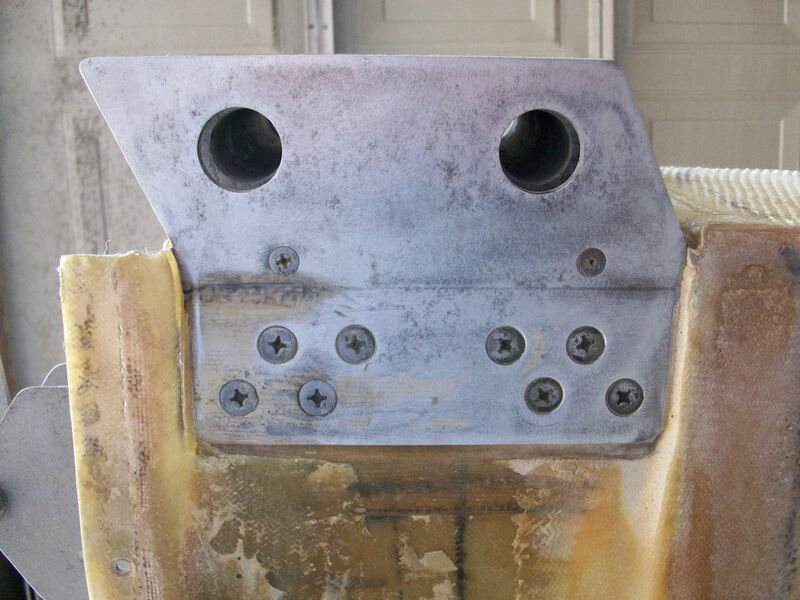 UV exposure degrades the material properties of the epoxy matrix. ... the rest under the micro was actually in decent shape. If there was micro over the fiberglass/epoxy structure, then the UV didn't get through and damage it at all. ... I only sanded about half way through one layer of existing bid fiberglass. Here is a close up of the fiber glass now. 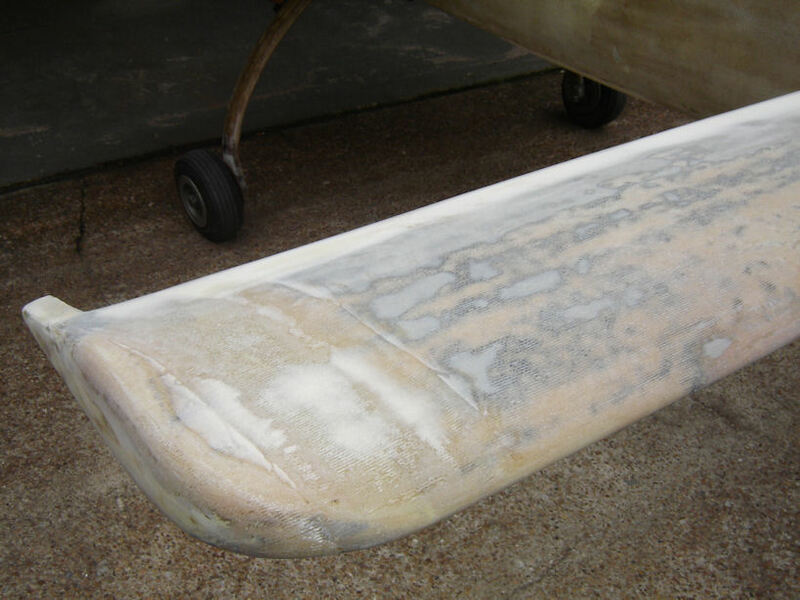 The canard is covered with UNI fiberglass, not BID. 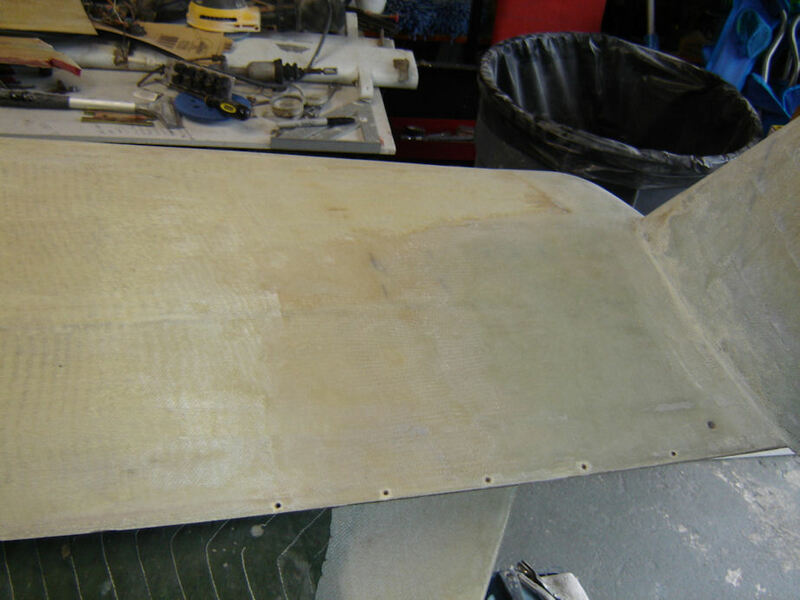 You're allowed to sand through about 1/2 of the outer layer of wing/canard/winglet/fuselage skins. Not that I like to rely on web pictures (or any pictures, for that matter) to evaluate layups, but what you've got looks fine. Micro and contour if necessary, then prime/paint. Putting on more layers of fiberglass would be useless, on an overall basis, anyway. Micro and contour if necessary, then prime/paint. 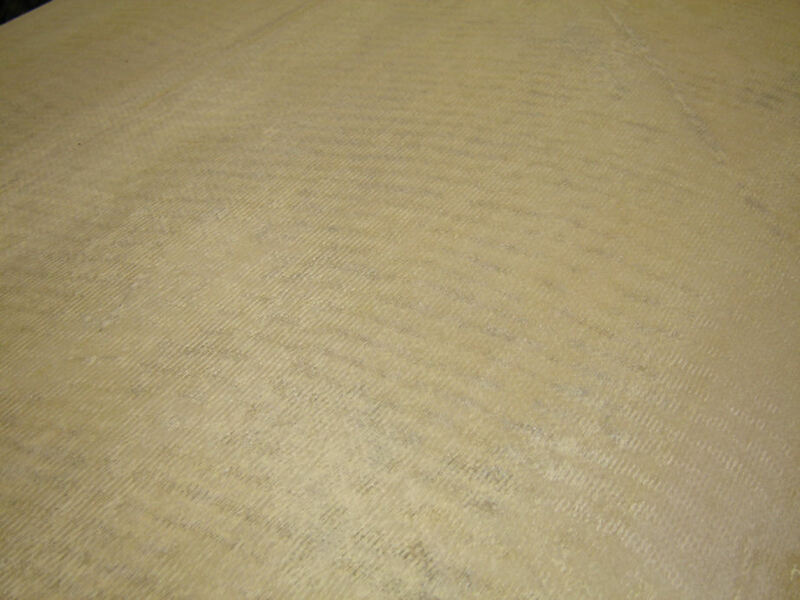 Putting on more layers of fiberglass would be useless, on an overall basis, anyway. This seems to be consistant with what other builders are telling me,I've one other person that has a long and a varieze under his belt that is going to come look at it. After that I'll go ahead and proceed. I thank all that are helping me with this project with your comments and advice. Its good to have so many people that are still interested in this bird and are willing to help. You NEVER want to put a structual fiberglass layer over micro. 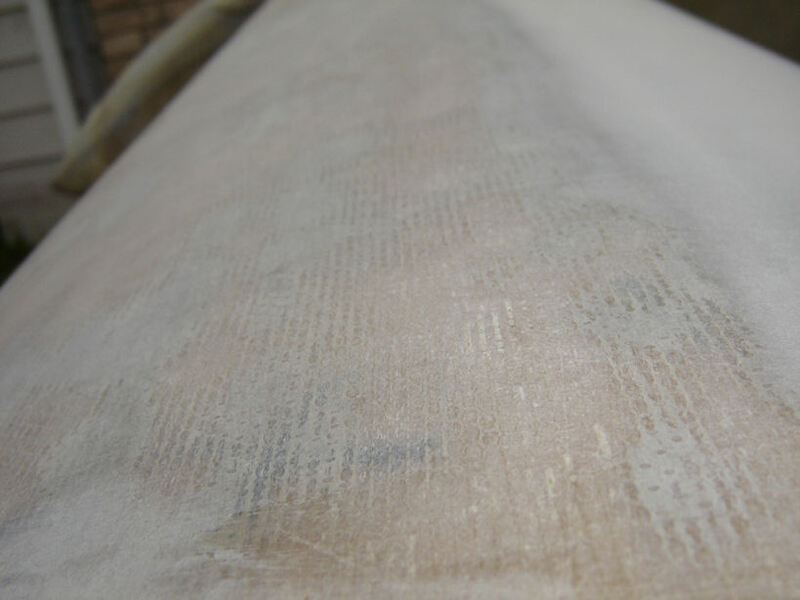 The possiblity of delamination and failure is too great. The manuals are clear on this. The less sanding you do into the top layer of glass the better. It's almost better to not sand down into the top layer at all. That IS the structure. You NEVER want to put a structural fiberglass layer over micro. The possibility of lamination and failure is too great. The manuals are clear on this. The less sanding you do into the top layer of glass the better. It's almost better to not sand down into the top layer at all. That IS the structure. first mistake you talked to the FAA. but you know that now. and those pictures that you had of the beginning of the build. you know the ones that got burned up in the fire. and the others that were looted from the house after the fire. with the receipts. the only way they know it was not owned by you is because someone told them. to bad you don't remember the name of your partner on this project. you know the one that you have known all your life and is now deceased. the same one that they would not know about unless someone tells them. so the local FAA knows about a vari eze that has no owner and some guy is trying to get it registered. I don't think they know about the new plane that someone and their wife build over 51% of called a eze vari. the one that they are trying to register in their wifes name with the help of an out of state DAR . lol, what plane,who said that, and where was he going ? what day is this ?.. Lynn, you crack me up, good answer. What an Plane? did someone say Airplane? 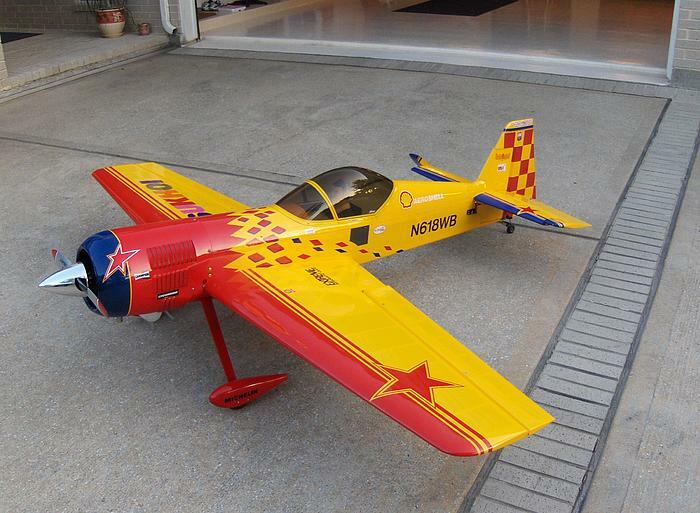 Does that guy really thinks he can build his own plane that flys? Now you are getting it. all you want to do is fly your plane. and you would think they would want to help. its their job. The FAA guys get paid one way or another. but the DAR takes your money so you can fly. Besides not everyone building an airplane can afford to own their own camera and take pictures of their project. you have to make choices when building, a used Brownie camera or a new Lightspeed Zulu one headset. That, any airplane guy will understand. I like, they got buried with my grandmother. no one would want you not to fly just because the pictures of the plane lay in piece with Granny. now that I think about it, maybe it was the camera thats buried with Granny. Who are we talking to h4h98? Might use the signature block feature. Some canarder in Houston probably knows where this airplane came from. I would see if I could track down the owner or his heirs and get a bill of sale, even if it costs you a few hundred. Check around with the old-timers at the Houston EAA chapters; someone might remember it. You never want to lie on FAA paperwork (a felony). If you don't get the repairman certificate it's not a huge problem. You can still work on the airplane yourself and do all the maintenance; you just have to get A&P help to sign off the annual condition inspection. EAA.org has lots of info about registering Exp aircraft. As Kent pointed out ..... the information is out there. You might have to do a little work to track it down but that is after all the best way to approach it. Suggesting that you lie to the FAA is not what I would classify as 'sage' advice. If they catch you in one lie, your credibility goes right out the window. Your questions will be answered in the plans. 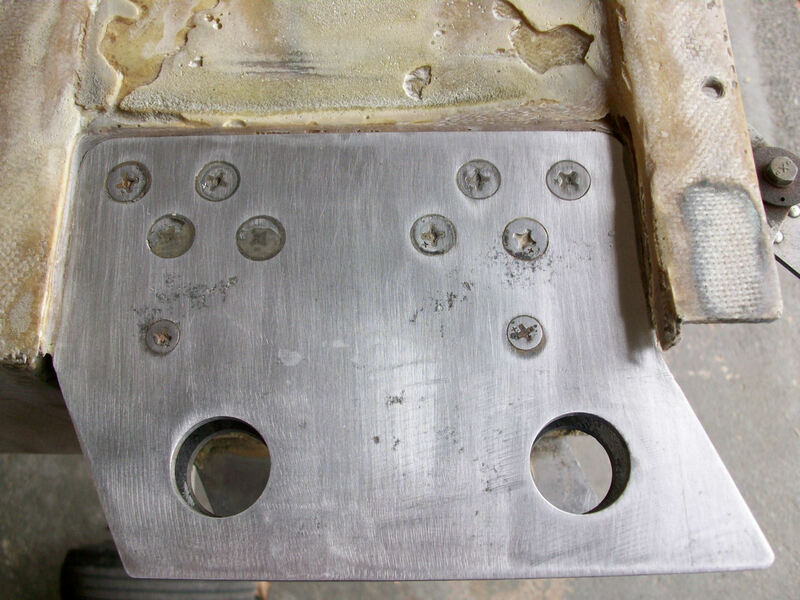 You will need a different epoxy since the plans epoxy is no longer made. MGS and others are available through Aircraft Spruce, Wicks and others. Do not use West and make sure it is EPOXY that you are getting. Marc has more information on approved epoxies on the www.cozybuilders.org website. Neither I nor one of the QC people here at Scaled who I asked to take a look at your pics would fly with these attach plates and that corrosion. 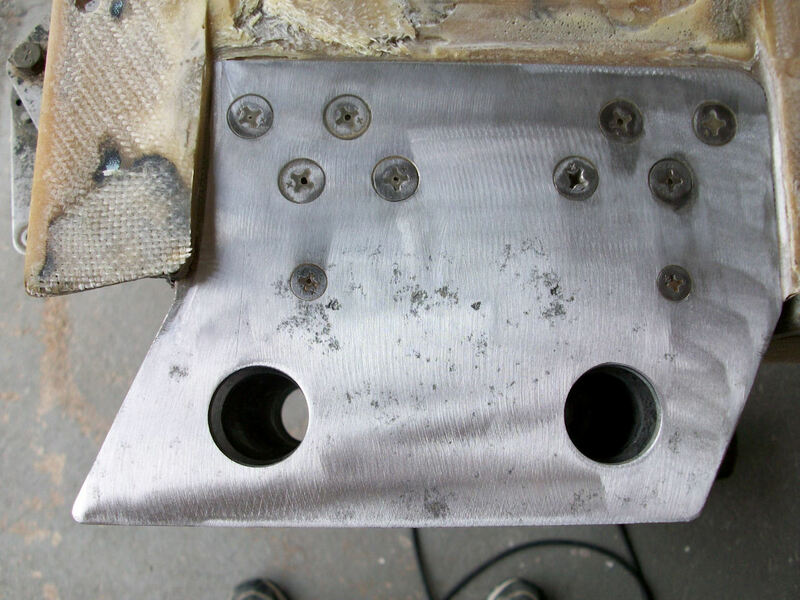 The screw heads don't look great either, and given what we've seen with hidden corrosion of screws, I'd at least want to remove them and examine everything underneath. The glasswork in this area is marginal, as well, but since the other pics you showed seem to indicate decent enough composite work, I'm going to assume that it's a function of the pictures and your sanding that makes it look dry and ratty. As in "The Scaled Composites"? Wow now thats what a I call a valued opinion. Well I hate to see it come to this, but this plane may need more than I am prepaired to do. It might be easyer to start from scratch and do a long.